This tutorial will show you how to sew up the side of your wrap skirt and add an elastic waistband, so you can convert a wrap skirt into a normal skirt that you can wear it with confidence! See Part I of this series here, where you'll learn how to add an invisible zipper to your wrap skirt. I've had these two wrap skirts for years, and I never wear them. 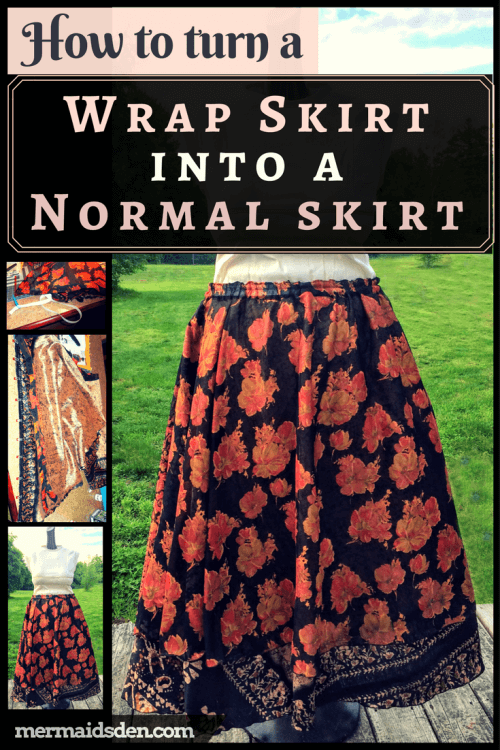 In the first part of this tutorial, I refashioned a wrap skirt that was just about the size of my waist. These two skirts are much larger than my waist, so I'm going to gather up the fabric with an elastic waistband. Here you can see that I've pinned the two layers together on either side of the skirt. This skirt has a floral printed top layer and a crackle printed bottom layer. Sew these two layers together on either side of the skirt. Do not sew up the middle just yet. Your skirt should still be one long piece of fabric with an opening in the middle. Now you can turn the skirt inside out and pin the two sides together, closing up the skirt. Don't sew over the waistband ties. Start sewing just beneath the waistband, and go all the way down to the bottom of the skirt. Once you've sewn up the side hem, cut the waistband ties, leaving 1-2" on either side. Thread your elastic through the hole in the waistband that you made when you cut the waistband ties. As I was doing this, I realized that the hole for the waistband tie was in my way. Carefully cut the stitching out, making sure not to cut the waistband all the way through on either side. Clip or pin your elastic and try on your skirt to make sure it's the right size. Adjust as necessary. I serged the elastic/waistband closed. You can also use a zigzag or overcast stitch here. Even out the gathers around the skirt, and zigzag around the whole waistband. This will keep the fabric from bunching and the elastic from rolling. Sew up the area where you removed stitches from the waistband with a wide zigzag stitch and a short stitch width.